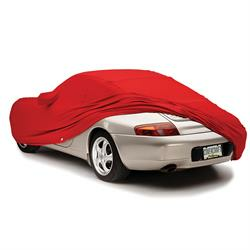 High-Performance Cover Exclusively manufactured by Covercraft. Finally, a cover that provides maximum protection but isn't bulky and hard to store. Unlike traditional manufacturing processes that just protect one side of the fabric, WeatherShield®HP uses a variety of computerised fibre encapsulation processes (Nextec's EPIC®) to place protective finishes that penetrate through the fabric. The EPIC® process provides comprehensive protection from the elements. Being constructed from a single, multi-functional layer, Weathershield fabric is extremely breathable and does not retain water the way thicker, multi-layer covers. Any small amount of water ingress, condensation or heat can easily escape through the cover rather than being trapped next to the car's bodywork. The new Weathershield®HP material marries solution-dyed fibres to the EPIC® finish. As the colour is extruded inside the fibres they require no dyeing after weaving. This process ensures maximum UV protection and colour fade resistance. This process also SAVES 1,000 gallons of water for every 1,000 yards of fabric produced when compared to conventional dyeing processes. All Covercraft covers are manufactured to order and delivery is typically 14 - 21 days. UK courier delivery is provided free of charge on all orders. As custom items these covers are non-returnable. Excellent website, easy to order. No problem.